A proposed rush-hour ferry could open as early as April of next year. With the booming Seaport District choking on traffic, state officials are launching an aggressive plan to get some commuters off the roads and crowded shuttles and onto the water by next spring. But first, they need to shore up funding to make it happen. The Massachusetts Convention Center Authority last week said a planned rush-hour ferry service between North Station and the South Boston waterfront could launch as soon as April. The agency laid out two options for a one-year pilot service, which would be run under contract by a private company. One would have two boats depart in 20 minute intervals, costing $2.6 million a year. The second alternative would use three ferries departing every 15 minutes, and cost $3.1 million. The 13-minute ferry trips would run between Lovejoy Wharf near North Station and either Fan Pier or Pier 4 in the Seaport, depending on the size of the boats. Bus service may also be added to get commuters to and from the docks. To pay for the service, the MCCA hopes to pool money from various private companies in the neighborhood, as it already does for bus service between North Station and four Seaport companies. Three of the four companies — PwC, Goodwin Proctor, and Vertex Pharmaceuticals — either declined to comment or did not respond to requests for comment on the ferry proposal. The fourth company, real estate developer The Fallon Co., owns Fan Pier, and president Joe Fallon said the company is “excited about offering our transportation dock in support” of the ferry. But James Folk, the MCCA’s transportation director, said he expects at least six Seaport companies are willing to pitch in, and intends to collect formal commitments in the coming weeks. Employees at the participating companies would ride for free, while the public would pay a to-be-determined fare. However, Folk warned the ferries could be full if enough companies opt in to paying for the service. The commuter ferry would also require a new dock at Lovejoy Wharf, at an estimated cost of $1.2 million. Folk said that work should be completed by January. But here, too, funding for the wharf is not finalized. 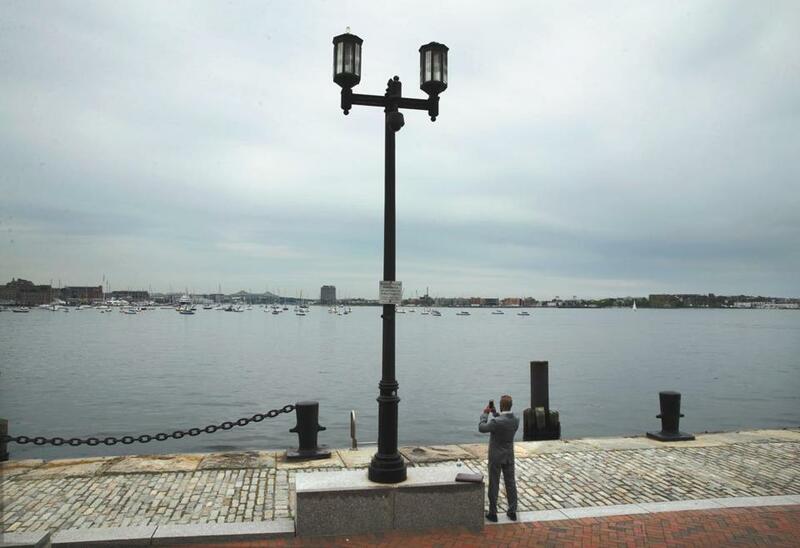 The dock funds are expected to come from real estate developer Related Beal, which built the Converse building and homes along the wharf, and the Massachusetts Department of Transportation, Folk said. A spokesman for Related Beal declined to say how much the company will contribute. MassDOT spokeswoman Jacquelyn Goddard noted that the department has committed $25 million to improving transportation along the booming but traffic-congested South Boston waterfront. The goal is to improve access to the Seaport for commuters from north of Boston. Folk noted that traffic makes even employer-sponsored bus service unpredictable between North Station and the neighborhood. This is one of several efforts to divert commuters to Boston’s waterways, which currently host some MBTA ferry service and on-demand water taxis operated by Boston Harbor Cruises. Separately, MassDOT is working with the nonprofit Boston Harbor Now to study increased ferry options for Boston and other parts of coastal Massachusetts. Wynn Resorts also plans to operate ferries between Boston and its upcoming Everett casino. Hubway, the regional public bicycle system, launched a new app for iPhone and Android last week, while also announcing special prices to lure more people to bicycles during the Commonwealth Avenue bridge work that will disrupt commutes over the next several weeks. Several third-party Hubway apps have been released in the past, using the system’s data to show the nearest station and how many bikes and open docks were available at each location. The new app, the first released by Hubway, has these functions, but also lets riders purchase tickets or annual passes on their phones as well. As part of the release, Hubway introduced a $1 fare special through Aug. 14, available only through the app. Riders can also purchase an annual pass during this period for $79, a $20 discount. Those will be available to riders throughout the system but are timed to the Commonwealth Avenue project, which should be over by mid-August. While most automotive traffic and Green Line service will not be allowed over the bridge, cyclists can still ride through. Hubway is also adding temporary stations along Commonwealth Avenue during the work. The sale prices are available for rides from all stations systemwide, Hubway spokesman Benjy Kantor said. The system, which is operated by the private bike-share company Motivate, has more than 180 stations in Boston, Brookline, Cambridge, and Somerville.